Saw one was posted earlier but it didn't have everything I wanted out of a True Combat Elite server so I decided to make my own. Goal is the same pretty much, to get people together to do some TCE/CQB, schedule dates, and to hang out and chat once we get enough people TO chat. Would also be amazing to set up some competitions once we get enough people to join, maybe we could even do a small cash prize. Any developers who worked on TCE are welcome to join and will get a special role. Feel free to check it out and feel free to also visit the other Discord that was posted previously. Nothing saying you can't hang out in both! As a quick heads up, we got all of the files needed to play ET, TCE, and CQB re-uploaded with links in the Discord. Now anyone can join and install the above without having to scour all over the internet just to get the game installed! Also note that an easy installation pack has been uploaded allowing people to simply drag and drop the game so they don't have to deal with installing everything which has been expressed to be complicated by a lot of people. 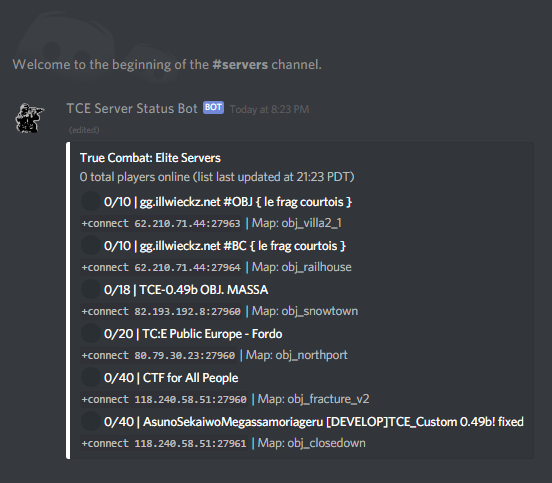 Heyo guys, dropping in to say we've hit 35 members and we got a kickass bot made by a user in the community called "020" that shows live feed of the current servers online for TCE and updates whenever someone leaves or joins. Cool stuff for those interested in tracking the player base without having to hop in-game and check! Also lights up blue next to each server to match our @Players role so people can see at a quick glance which servers has players, a nifty little addition by 020 himself. We also have two server owners in as well, if you're a server owner and want to join we highly encourage it! Many thanks to 020 for getting this up and running! We recently hit 100 members and got our first two emotes and a bot that plays music (Radio Chatter). Not a big update but shows we're still growing strong. I'm still working on getting that banner going for the 3 events we're doing next month and will be out soon.